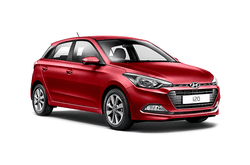 As the Hyundai i20 has become more and more popular, it has significantly grown in size over the outgoing model. This only increases its popularity among car rental customers. With all of its advanced features, accessories, and custom options it's no surprise the second-generation supermini is one of the most practical and spacious in its class! It features a spacious and comfortable interior and all the features you would expect in a new model Hyundai. With this new upgrade, the Hyundai i20 continues to impress and remains a popular option for drivers of all types who know that you do not have to sacrifice comfort in order to get a luxury vehicle. Experience it today for yourself!